It’s fun to read “how to write” books. The authors are so confident and clever. They can solve writing dilemmas with a witty phrase and well thought out (and punchy) delivery. But sometimes, after I’ve finished my fifth chapter and am trying to absorb the wisdom on the page, I realize that I am really a “show don’t tell” girl. I learn more easily from a well crafted sentence and a “keep them wanting more” story line. With all due respect to writers of “how to write” books, sometimes my best education has come from just spending the day with a good novel. 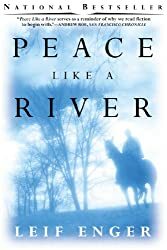 After I read Peace Like a River by Leif Enger the first time, it occurred to me that maybe I should quit writing fiction. It was a work of such beauty and authority that I felt nothing I did could ever be enough. I have seen it compared to “To Kill A Mockingbird” in its simplicity and wonderful characters. I wanted to write like that. “If John Calvin was right, destiny had a serious grudge against Tin Lurvy, a purple faced, futile, tragically sociable traveling salesman.” Enger just has a way with words. What writing book can teach you to describe someone so beautifully? Sometimes you just have to see it to believe it. After some soul searching, I realized quitting wasn’t an option (I loved writing too much), and I decided to try to learn instead. And Peace Like a River would be my text. I read. I highlighted. I underlined and digested. I marveled. I even, God forgive me, envied. But I also had a great time and maybe even absorbed some wisdom along the way. Then, when I read my own writing, I started cutting away the extraneous. I tried to avoid clichés…not because Leif Enger told me to, but because his book was so much better without them. I searched for the better word, the less cumbersome description. My writing group also pointed out the obvious. To remember that I wasn’t Leif Enger and I had a style of my own. That I should learn from the skill of a master craftsman, but I should make my work my own. I now reread Peace Like a River at least once a year. My soft cover copy is dog-eared and the pages are slashed with yellow highlighter marking favorite sentences. It has become my go-to “how to write” book. There are, of course, endless numbers of books to chose from. Find something that you love and see what the author does that makes you enjoy it so much. Keep reading the professional “how to’ers” …they have much to offer. But polish the rough edges of your writing with that book you love. It could be the stranger on the street who doesn’t look like the conductor of the St. Louis symphony, but who carries the keys to the mystery of how to write the very best book you can. This entry was posted in Books, Writing and tagged books, fiction, Leif Enger, writing, writing how-to, writing instruction by PaddleCreekWriters. Bookmark the permalink. Great advice, Bev. Learn from the masters but be yourself. Thanks! Terrific insight. Keep it coming because it is great. I agree with Susan, keep it coming!